Hi everyone! 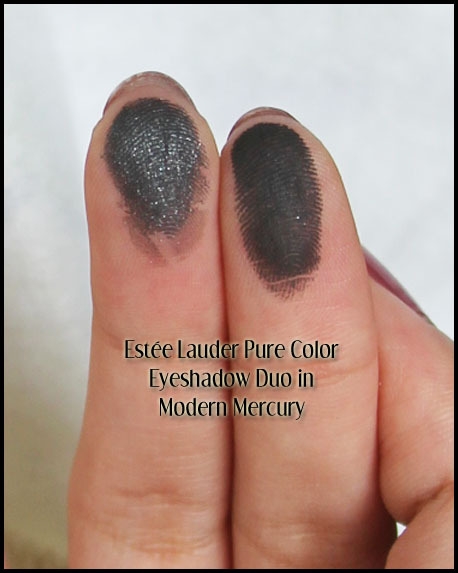 As promised, here is my review of the Eyeshadow Duo in Modern Mercury from the latest Estée Lauder collection. I received this, along with the Five Color Eyeshadow Palette in Enchanted Berries, and I am loving them both! What I really love about this palette is the matte black. Unlike so many other so-called matte blacks, I don't detect even a hint of shimmer, nor is it chalky or powdery in any way. It is pigmented and smooth and buttery, and so easy to apply! I have tried angled eyeliner brushes, fluffy blending brushes, and smoky eyeliner brushes - they all pick up this product and spread it onto the eye effortlessly. It is truly a pleasure to use! The shimmery colour is also buttery smooth, and really beautiful. Despite the swatch, this actually applies pretty sheer, but builds easily into this intense, shimmery, gray-black. 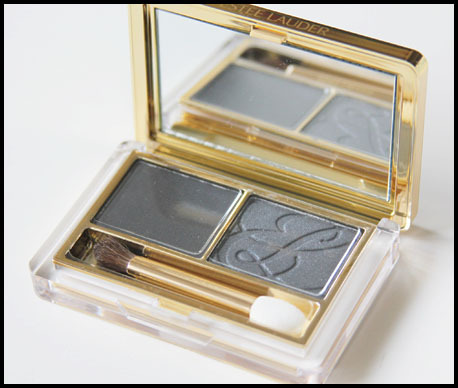 I didn't experience any fall down at all with both these eyeshadows, which I found a pretty amazing feat, given that I was trying a whole lot of different looks and kept readjusting the eyeshadow. One thing I should mention is that these colours are very much more suited to cool-toned girls. I would have prefered trying out colours that are more suited to my skin tone, but that doesn't in any way take away from the quality and beauty of this product. To close this review, I leave you with a picture of the smoky eye look I posted yesterday, just to show you the overall effect of this eyeshadow duo. I applied the shimmery black eyeshadow to the entire lid up to the crease, and used the matte black as a smoky liner underneath the liquid liner to enhance the smoky effect. This eyeshadow duo, along with the rest of the Modern Mercury collection, launched at counters August 7th (yesterday!!). Most of the items in the collection are limited edition, so if you are interested, make sure to get in quick before they are sold out. This eyeshadow duo retails for AUD 58.